Cost–benefit analysis (CBA) has been an important policy tool of government since the 1980s, when the Reagan administration ordered that all major new regulations be subjected to a rigorous test of whether their projected benefits would outweigh their costs. Not surprisingly, CBA has been criticized by many who claim that it neglects, especially on the benefit side, important values that are hard to measure. 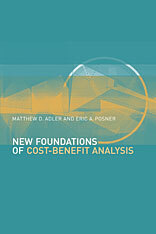 In this book, the authors reconceptualize cost–benefit analysis, arguing that its objective should be overall well-being rather than economic efficiency. They show why the link between preferences and well-being is more complicated than economists have thought. Satisfying a person’s preference for some outcome is welfare-enhancing only if he or she is self-interested and well-informed. Also, cost–benefit analysis is not a super-procedure but simply a way to identify welfare-maximizing policies. A separate kind of analysis is required to weigh rights and equal treatment. This book not only places cost-benefit analysis on a firmer theoretical foundation, but also has many practical implications for how government agencies should undertake cost–benefit studies.